in one 20-pin motherboard connector and two 4-pin hard disk power connectors as shown. Direct mount available upon quantity request. These are minature power supplies with 12 volt DC input. 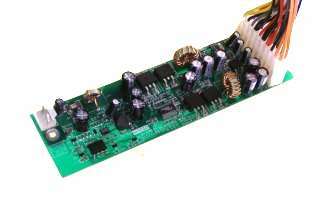 They are useful for applications where battery or solar power is available, such as car computers, and homemade MPX players. These are regulated switching power converters. 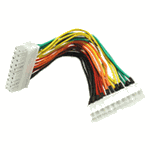 Includes wide voltage range input versions 10.8-20 VDC, suitable for car PC and automotive computer applications! Note that the PST-ITX-1 mini-itx version does not have a regulated +12 volt output, but passes the 12 volts of the supply voltage through to the motherboard. This makes it difficult to use for automotive applications. The wide input range unit is the PST-ITX-2, which has an input range of 10.8 to 20 volts. If you need regulated 12 volts, then you should choose the PST-ITX-2. Quantity Price PST-ITX-3 power board. 20 pin ATX adapter cable. Note : current production device is direct plug-in, but cables are available if direct-plug-in to the mother board is not desireable. Board includes the 4 pin 12 volt P4 motherboard connector (not shown here). PST-ITX-4 or PW-200-M identical electrical specifications, different form factor click here.